Up to 50% Off Deals of the Week at eBay Be sure to check out the deals of the week at eBay and save yourself up to 50% off your orders! Gifts, Clothing, Electronics And More For Under £10 At eBay Discover the under £10 shop at eBay! Make massive savings on a huge range of products including gifts, clothing and electronics. 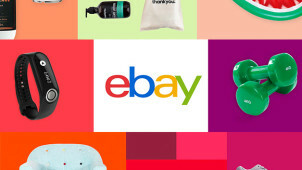 Free Delivery on Selected Orders at eBay Shop the range of amazing deals at eBay today and qualify for free delivery on selected orders. £25 Off Orders Over £500 in the Sofa Collection at eBay - Including Sofa Beds Head to eBay today and shop £25 off a range of sofas this Easter. £40 Off Selected Appliances Plus Free Delivery in the Home and Spring Clean Sale at eBay The Home and Spring Clean Sale is now on at eBay! Save £40 on a range of appliances. Free Click and Collect on Orders at eBay Select Click & Collect when you pay at checkout and choose the eBay Collection Point location you’d like to collect your parcel from. 20% Off Bikes in the Halfords Store at eBay Pick up a new bike this spring and save 20% on your orders in the Halfords Store at eBay. Shop 80% Off Women's Trainers at eBay - Including adidas & Reebok Need some new trainers? Shop the range and save 80% on branded trainers at eBay. £40 Off Selected Clothing, Accessories and More in the Outlet At eBay From Next to Superdry and Topshop, make huge savings in the outlet at eBay. In short, eBay sells everything! It’s the number one online marketplace for buying everyday items, larger investments and special purchases. With eBay, you can buy for yourself, or pick up a gift for someone special - you’ll always pay less and you'll definitely have more fun! Now you'll be able to make amazing savings on a world of Fashion, Electronics as well as bits and bigger bobs for the Home & Garden - eBay only works with certified and reliable stockists so you can always rest assured that you'll be getting a really good deal. Whatever you’re into, you can fuel your hobbies with eBay. Whether you’re an amateur photographer into editing software and lenses, or if you’ve got the fitness bug and want a new addition to your home gym - there are extensive categories for everything. Feeling creative? Choose a canvas, sew on some buttons or decorate your home with craft supplies from. For baking enthusiasts, you can even practice at home with cake making accessories that are fit for Mary Berry herself! Whether you buy, sell or do both with eBay - you will always be quids in and feeling satisfied. Creating listings for your favourite things that are past their heyday or for the items that you never got round to using (we've all got them!) - eBay is the perfect solution to finding them a good home whilst giving you something back too. Click ‘Confirm and pay’ to complete the payment. Sign up to the eBay newsletter and get incredible offers sent straight to your inbox - no faffing! The prices are so reasonable on eBay so you could say that every day is Sale day. However, you can find lots of great offers on the Daily Deals page to get your money off kicks all year round. How do I track my order on eBay? Postage and delivery times should be specified in the listings and you should also receive email updates to let you know when your order has been dispatched. There should be details underneath the listing of the item you have bought, otherwise, you can use the Customer Service section to Contact eBay. How do I retract my bid? If you entered the wrong price to bid on an item or if you have had a change of heart for another reason, you will usually be able to retract your bid within 12 hours of the auction closing time. If there are less than 12 hours left then you should contact the seller directly. Delivery methods vary from seller to seller and from product to product. For more information and tips on delivery, click here. Returns policies differ for each seller and for different products. Businesses on eBay offer a 14-day returns policy. Click here to find out more about returning your eBay purchase. Or when signed into your account the Contact Us page has information on the best way to get in touch. Since 1995, eBay has been letting people everywhere access amazing goods. For yourself, the home or to gift another - eBay is your platform to millions of products from big and small businesses. With an eBay discount code there are even bigger savings to be had. Here, you can buy and even sell pretty much anything you want; from funny gifts to treasured items to complete a long-loved collection - someone’ll want it on eBay! If you choose your buying time wisely, a bit like skipping the queues when you’re out shopping - at eBay you could be more likely to find a bargain and get rid of the competition. If you want to bid in an auction, find items that are ending soon and have no bids, or that are ending at an unsociable hour and there will be less people bidding. So if the price is starting low you might get a bargain! For all discerning fashionistas and for those who just love a good bargain, eBay is the place to be. Shop your entire wardrobe in the Fashion category and find your favourite brands for less with an eBay voucher from us, as well as vintage clothes, accessories and more. For all seasons and all occasions - you can count on eBay - the thrift shop with a difference - this is where we get our wardrobe kicks.